Add a touch of elegance to any room in your home by turning to our flooring store for exceptional products. We not only offer a variety of wood floors for any taste or budget, but we also provide expertise from our showroom’s experienced staff. When it comes to timeless elegance and charm, our hardwood flooring in Minnesota City, MN stands at the top. This material comes in numerous shades, grains, and wood species, which means you’re sure to find something to fit your style. Our flooring store features trained specialists who guide you to the perfect selection. Just imagine the deep, rich color of wood in your dining or living room. Once you find your choice, our expert installers ensure an exact fit every time. We carry only the most trusted and proven brands that come with the highest quality. Engineered hardwood from brands like Downs and Parmount Flooring gives homes a stunning look and increases their overall value. We also have a diverse range of solid hardwood materials that are bound to last for decades. Our team of experienced specialists is always nearby to assist in every part of the process--from selection to installation. We first talk to you about why you want hardwood floors and what you need them to do for you. If you want hardwood in your bathroom, for instance, we may suggest that you go with an engineered product to protect your floors from mold and mildew. Our sales professionals have extensive knowledge about all the products in our showroom, allowing you to find the one that suits your needs. To ensure you get total peace of mind about your purchase decision, our design specialists help you pick the right colors and sizes of planks. We can even show you how different wood products may look like in your living space. After you have your ideal product picked out, our hardwood flooring installation professionals can take over the rest of the work. After years of experience, they know the proper installation techniques to ensure your new wood floors stand the test of time. You can browse our selection either in-store or online at your convenience. We always give personal attention to each customer as we strive to meet preferences for style, performance, and price. Give your rooms a fresh look with solid, engineered, or handscraped hardwood crafted for great looks that last. We even offer free pre-measurements so you get a better estimate sooner. Let our team guide you to the perfect flooring choice for your home. There are several differences between solid and engineered hardwood, and they each serve different purposes in the home. We are always happy to explain the difference and help you determine which is best for your needs. Nothing gives your home a radiant look quite like hardwood. It’s a natural fit for living rooms or dining areas. You’ll enjoy the unique grain patterns and knots on each piece. No two sets look the exact same, giving you an exceptional and dynamic floor. All of it is designed to withstand heavy traffic without buckling or creating gaps. Once it’s set down, there’s no worrying about it. Cleaning is simple and easy because wood doesn’t absorb dust, hair, and other particles that irritate those with allergies. Simply follow the manufacturer’s care instructions when it comes time to tidy up. You’re sure to fall in love with the engineered options we offer. Check out our selection of Downs, one of the most trusted names in flooring. For more than four generations, it has been producing wood with superior construction and durability. If you want a dark and richly textured floor, browse our stock of Floorcraft hardwoods. They’re known for crafting planks and strips with exceptional quality and value. You and your guests will notice and appreciate the classic look of wood species like red oak and pine. No matter which brand of engineered hardwood you choose, you can count on it to hold up to the moisture and temperatures of rooms like the kitchen and bathroom. It has a non-porous surface which not only repels dust particles, but also water and moisture. This means you won’t have to worry about mold and mildew ruining your floors. Our customers choose solid hardwood because of its elegance and longevity. The panels consist of a single slab of wood, making it a highly durable option. Combine its rugged construction with our outstanding warranties and you are guaranteed to be completely satisfied with your new floor. Once we install it, this flooring maintains its beauty for a long time. When it does come time to spruce up the material, refinishing is a great option. You can sand, buff, and resurface solid wood multiple times because it is a single piece. In fact, if it is well taken care of throughout the years, it can last for more than a century. Many of our customers choose this option because it gives them the versatility to change the color later through staining. You can start a home redecoration project today by starting from the ground up with luxurious wood floors. To make a house into a home, sometimes you need to start with a lived-in feel. So many people seek our handscraped hardwood because of the warm and inviting atmosphere it creates. Without changing its integrity, our flooring manufacturers add a surface texture that adds even more elegance to your floor. The hand-scraping process brings out the full beauty of the solid wood without compromising on durability or ease of cleaning. Visit our store to see the difference for yourself. Choose stylish and durable solid hardwood that lasts for generations. The panels consist of a single slab of wood, making it a highly durable option. Combine its rugged construction with our outstanding warranties and you are guaranteed to be completely satisfied with your new floor. Once we install it, this flooring maintains its beauty for a long time. When it does come time to spruce up the material, refinishing is a great option. You can sand, buff, and resurface solid wood multiple times because it is a single piece. Many of our customers choose this option because it gives them the versatility to change the color later through staining. You can start a home redecoration project today by starting from the ground up with luxurious hardwood flooring. To make a house into a home, sometimes you need to start with a lived-in feel. So many people seek our handscraped hardwood because of the warm and inviting atmosphere it creates. Without changing its integrity, our flooring manufacturers add a surface texture that adds even more elegance to your floor. The hand-scraping process brings out the full beauty of the wood without compromising on durability or ease of cleaning. Visit our store today to see the difference for yourself. Best of all, this kind of flooring is sure to stay in style for many years to come. To see the most out of your new hardwood floors, let our experienced installers set every piece in its place. Invest in your new flooring by having it professionally installed. We take the time to fit every edge to give a seamless look. 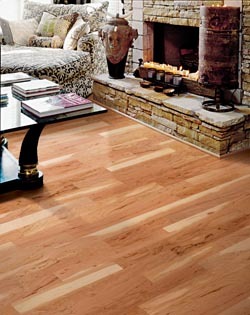 Proper hardwood flooring installation also ensures the maximum life expectancy of your surface. Since we’re locally owned, you’ll be dealing with community members who give personalized service not found at other home improvement stores. We are committed to excellence and to pleasing our customers. If for any reason you aren’t 100 percent satisfied a 4-Star or 5-Star product you’ve purchased from us, rely on our Ultimate Confidence Guarantee. You’ll have 30 days to take advantage of our warranty, and we will replace your floor and even pay for the labor. We also offer a Lifetime Installation Guarantee, which states that if you ever have an installation-related problem with your hardwood flooring, we’ll fix the problem at our expense. Our industry-best warranties and guarantees are put in place because we are dedicated to your satisfaction and enjoy the proud look when people see their new floors. To start your next home improvement project, stop into our showroom and start exploring our vast inventory. Even if you’re not sure where to start, our team of friendly and knowledgeable professionals is here to help you every step of the way. Contact us today to request more detailed information about our selection of solid and engineered hardwood flooring. We proudly serve Minnesota City, Winona, Goodview, Buffalo City, Dodge, and the surrounding areas in Minnesota, as well as Arcadia and Galesville, Wisconsin.